Hi, I’m Orains! I’m a gorgeous boy who’s just learning that how to “cat”. I’m a bit shy and hesitant at first, but once I get to know you I’m super playful and love attention. 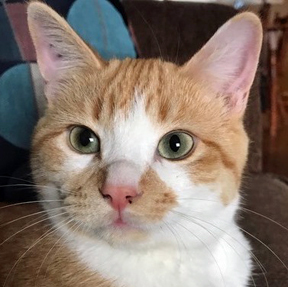 I’m looking for a purrfect furever family that will give me time and space to become comfortable in my new home. I’m always the first on the scene at breakfast and dinner time. I’ve learned that being picked up isn’t so bad and that snuggles and scritches are the cat’s meow. I have a huge motor and will purr for you on command. My foster siblings have taught me how to wind around your feet when I want you to stop and listen to my endless stories; did I mention how much I love to talk? I always win gold at bedtime too, racing to beat everyone to bed for a game of “catch the mouse” before running off to do cat stuff with my friends. I feel most secure when I have another feline friend to help me be brave, so if you don’t have one, maybe you could adopt my sister too. I haven’t been around dogs or little people yet, but I’m young so I’m sure I’ll love them if I’m given a chance to get used to them. Orains could be your perfect match. *Orani has been sponsored by one Christmas Guardian Angel.